Vietnamese food is known to be healthy and robust in flavor. The generous combinations of fresh herbs and greens, paired with seafood, beef, and rice makes the meals to be more nutritious and healthy. It is worth noting that many cities in like Ho Chi Minh City and Hanoi offer venues as well as five-star hotels that decked out in extravagant settings sells some of the best Vietnams best dishes. Also, there are other road eateries as well as vibrant market restaurants that offer such kind of foods to both local citizens and tourists. A typical meal contains rice or noodles, meat or types of seafood as well as vegetables and soup. The meals are customized according to your preferences. Pho is essentially Vietnam’s signature dish that comprises of noodles that are flavored by soup with various greens, meat plus a fermented fish or chill sauce that makes it more delicious. The first bowl of pho will contain sliced beef (Tai), beef meatballs (Bo Vien) or name (beef flank) that is topped with sprouts of beans. Depending on the type of restaurant, you can opt for exotic ingredients such as gan, search and ve don (flank with cartilage). In most cases, the food is eaten for breakfast and is sliced into places depending on the restaurant of the market in Vietnam. Refers to one of the French-Vietnamese sandwiches that is suitable when you are in search of a quick meal. It consists of a toasted baguette sandwich, soy sauce, cilantro, hot peppers, pate, pickled vegetables, and butter. Other sellers prefer meat fillings such as roasted pork belly, fried eggs or even boiled sausages. It is similar to a pancake or a crepe. It is made of rice flour, turmeric, chicken, coconut milk, shrimps, bean sprouts, as well as mushrooms and sliced onions. Market and road-side sellers usually add its flavor using lettuce or rice papers. 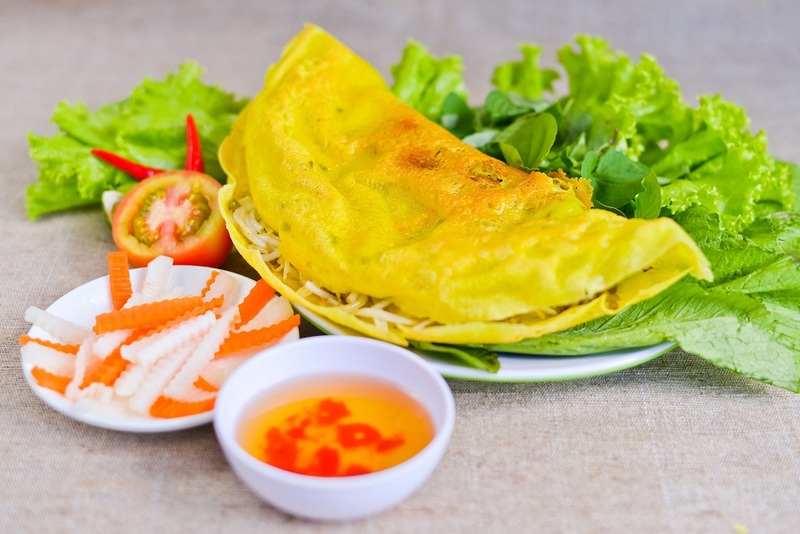 The crepe can be eaten together with lemongrass pork skewers or by dipping it in fermented peanut sauce. It consists of thin vermicelli noodles, pork slices, basil, shrimp as well as lettuce that are well wrapped in translucent rice papers. Due to its flavor, the roll is dipped into ground chilies as well as a hoisin-based dipping sauce that contains crushed peanuts. The snack is an appetizer and an alternative to Cha Gio. Although the noodles are available in most of the restaurants in Vietnam, they originated from Da Nang. Initially, it was distinguished due to its rice noodles that were yellow. The foodstuff is thus a mixture of bone broth that is seasoned with fish sauce, garlic, and black pepper among other meaty ingredients. In Vietnam, the noodles are always served with herbs, peanuts, lettuce as well as sliced banana flowers and rice crackers. Thus, next time you think of traveling in Vietnam, visit any restaurant or rather an active market or roadside seller and order some of these foods stuffs. The foodstuffs are relatively cheap and nutritious as well. Even if you are a visitor, ordering such food staffs guarantees you of safety as you easily identify with the Vietnam’s culture. Also, the food staffs aren’t only healthy but they are also delicious due to the natural flavors as well as seasoning that are added.